Corby Town have completed the signing of striker Matt Gardner. The frontman arrives at Steel Park from Evo-Stik League South rivals Chasetown and will go straight into the squad for Saturday’s home clash with second-placed Frickley Athletic. Gardner started the season at Coleshill Town before joining Chasetown and he has also played for the likes of Bedworth United and Alvechurch. 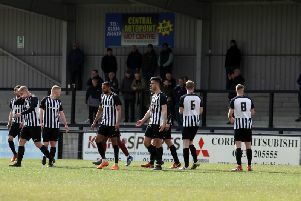 Corby caretaker-manager Steve Kinniburgh, meanwhile, has confirmed the club will not be seeking to extend the loan deal of Northampton Town striker Leon Lobjoit. Kinniburgh said: “We won’t be looking to extend that that deal. “Leon has had a lot to deal with in his personal life and it’s important he has the time to deal with all of that.